To appreciate the geological setting of Ledbury you need to imagine this piece of the Earth’s crust about 425 million years ago. You would have been in a warm, tropical sea about 30 degrees south of the Equator. To the east was continent; to the west was a deep ocean and in a broad zone just east of the Welsh Border was the continental shelf, which supported the growth of reefs not unlike the Great Barrier Reef of Australia today. The reefs and sea floor sediments of the day became consolidated into limestone rock. This limestone rock together with other younger rocks are explored along the trail. This trail follows a route over Chase End Hill, the southernmost outcrop of the Malvern Hills, into the valley at Whiteleaved Oak and on to towards the village of Bromsberrow. Along the way you will visit an old quarry in the metamorphic rocks of the Malverns Complex and enjoy stunning views all around from the top of Chase End Hill. The Whiteleaved Oak Shale and Bronsil Shale have been baked by igneous intrusions which are seen in a small secluded old quarry, and rocks derived from erosion of the mountains which are now the Malvern Hills are seen beside the road to Bromsberrow. A sunken lane demonstrates desert sandstones, before returning to the start over beautiful parkland. May Hill is one of the most easily recognised landmarks of Gloucestershire and with its distinctive crown of trees on the summit, can be seen for many miles around. From the summit of the hill, twelve counties can be seen (on a clear day) and the geology and landscape of these surrounding counties is extremely varied. This guide describes the geology and landscape of May Hill and the views of the surrounding area from the Cotswolds to the Black Mountains, and the Malvern Hills to the Forest of Dean. It also explains the diversity of flora and fauna found on the hill. This trail starts in the Huntley Quarry Geology Reserve, and extends out into the surrounding area to look at other sections in the Silurian sequence. These include an exposure of conglomerates from the May Hill Sandstone, a faulted block of Woolhope Limestone, and a very impressive series of ‘ballstone’ reefs in the Wenlock Limestone at Hobb’s Quarry Site of Special Scientific Interest. 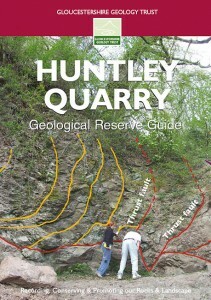 The Huntley Quarry Geological Reserve and its surrounding woodland is owned and managed by Gloucestershire Geology Trust. The reserve guide explains the unique geology demonstrated in a series of exposures, and how the Blaisdon Fault, which runs through the centre of the reserve, has affected the structure of the rocks. It describes the environments in which these rocks formed, the major earth movements they have been subjected to, the research carried out to determine the age of the rocks, and the ecology and biodiversity of the area. Gloucester in Stone explores the fascinating range of building stones that that make up the urban fabric of central Gloucester. The guide looks at the variety of local and imported stone used, why some stones are more popular than others, and how the use of building materials has changed over time. Robinswood Hill is an outlier of the Cotswolds, now a country park, owned and managed by Gloucester City Council. The main quarry on the hill provides the best inland section of Early Jurassic clay and siltstones and was once used to supply raw material for Gloucester brickworks. 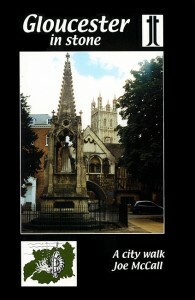 The many springs that emanate from the hill supplied the first running water to the city of Gloucester. Wainlode Cliff is one of the classic sections in the Triassic-Jurassic sequence in Gloucestershire. It displays part of a thick sequence of mudstones, cut through by gypsum veins and capped by Early Jurassic limestones. Crossing over Sandhurst Hill you will see gravels deposited by water from a melting glacier and can enjoy views of the River Severn below you, and the Malvern Hills in the distance. Returning along the river bank you pass over alluvial floodplains and remnants of earler river courses.